The buzz around our open letter to Apple hasn’t subsided yet, and lo and behold, Apple has filed today a patent related to augmented reality . Although the term Augmented Reality (AR) is not explicitly mentioned in the patent – it describes very common mobile AR scenarios. Technically speaking, you typically need 3 capabilities to enable a mobile AR scenario: sense, overlay, track. Apple’s patent deals with Sensing and Overlaying. 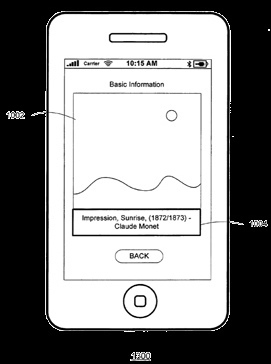 a new identification application apparently under development by Apple that would help identifying objects in a user’s surroundings so that their iPhone can present additional information about the identified objects. As much as it’s encouraging to see Apple’s interest in this domain, it sounds awfully similar to augmented reality research published over the past 10 years. Moreover, it actually describes the functionality behind existing AR browsing applications already in the market such as Layar, Mobilizy’s World Browser, Tonchidot’s Sekai Camera, Nru, and more! And how about augmenting Museum experiences? Has anyone at Apple read our roundup of AR museum experiences? Is there anything new in this patent? Can Apple defend it against previously published AR work? What do you think? Sadly, lots of things get patented with no regard for Prior-art. Whether the patent gets granted, is anybody’s guess. It will be very frustrating to see that many years after so many people dedicated years of their life to developing those techniques in academia and industry, a later wave of unrelated people will now reap the rewards. Whether it is the Web 2.0 crowd or Apple.